to southeastern golf course communities. THE GAME OF GOLF WAS BORN in normally cold and sometimes damp Scotland, where some areas are drenched with 120 inches of rain a year and where the high temperatures in the summer months barely tickle the mid-60s. Six hundred years later, more than 12 million Americans spend at least some time on the golf course, and many of them enjoy the privilege in a comfortable sub-tropical climate on magnifi cently manicured tee boxes, fairways and greens. 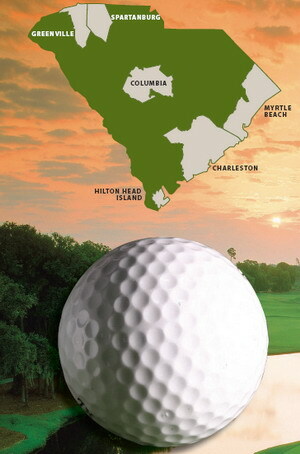 Welcome to golf South Carolina style, where you can hone your golfi ng skills, work on your tan or simply spend time with friends, all the while basking in an ocean breeze or breathing the clean mountain air and enjoying the fl ora and fauna that thrive in the Palmetto State-s temperate climate. In the northeast, at Myrtle Beach, Azalea Sands is "6,902 yards of pure golfing pleasure." In the north, at Rock Hill, Waterford Golf Club-s signature hole is a par 4 with a creek that runs in front of the tee box and along the left side of a split-level fairway to the front of an elevated green. In the northwest, in Pendleton, Boscobel Golf and Country Club-s featured hole is a par 4 with a small, sloping green guarded by a pond and bunkers. Out west, Cedar Creek Golf Course in Loris challenges golfers with three holes longer than 500 yards and an 89-yard par 3, surrounded by water and sand. In the southeast, the Bloody Point Golf Course was built around the Mungen River and the area-s coastal marshes and lagoons. In every corner of the state and everywhere in between, South Carolina-s courses beckon and challenge golfers of every skill level. © 2019 GolfBrokers.com. All right reserved. Website design and maintenance by Media Services, Internet Real Estate Marketing.